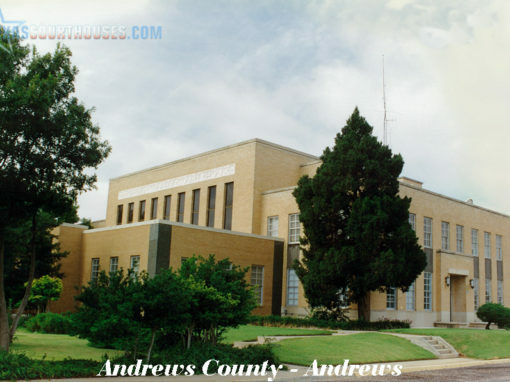 Located in the center of the public square the Milam County Courthouse is a monumental edifice on a cruciform plan. As was typical in Texas, offices for county officials were located on the ground floor and were accessible from corridors passing through the building on both axes. A spacious district courtroom occupied a large volume in the second and third stories. Additional offices also were provided on these levels in the area not occuped by the courtroom. Stairs at the east and west entrance provided access to the upper stories. To meet changing needs, the interior has been somewhat remodeled. The north entrance has been closed and the hallway made into office space. Other changes include the modification of upper floor areas to develop more office space. The Milam County Courthouse is an outstanding example of Renaissance Revival design. The identical north and south facades are five-part compositions while the east and west fronts are three-part designs. Each of the four fonts has a projecting center pavilion emphasized by a portico and triangular pediment. The entire massing was originally dominated by a central tower, clad with a decorative sheet metal skin rising above a Mansard roof with convex curvatures. Four clock faces projecting from the convex- curved roof covering this tower regulated community activities. Perched on a cupola above all was a statue of the Goddess of Justice serving as an ever-present reminder of one of the primary functions of the edifice. A three-part vertical composition conforms to typical Renaissance tradition: the base was emphasized by quarry- faced ashlar masonry; the center section, encompassing two stories, was tied together with pilasters of cut stone in colossal order with Corinthian capitals and smooth shafts supported upon pedestals; the terminal section of the composition was formed by a wide entablature originally formed with sheet metal. The details elaborate on the Renaissance theme. A cut- stone water table forms a base for the ground-story masonry while a strongly profiled cut-stone string course terminates this section. Above this course appears another cut-stone stringcourse which is more subtle in scale and which follows the window spandrels and walls in and out. The development of the designs for the openings provides variety. On the ground floor double window openings are contained within panels formed by pilasters; on the upper two floors triple openings also spanned by lintels are contained within panels defined by pilasters at both salient and reentrant angles. Below each window is a spandrel of cut stone. Paired windows spanned with Roman arches with pronounced sculptured keystones appear in the third story of the entrance pavilions as well as over the paired windows flanking the north and south facades; these arches have cutstone voussoirs with pronounced archivolts. The single third-story windows between the salient and reentrant angles are spanned by Roman arches with quarry-faced voussoirs. On the second story, below the Roman-arched openings the paired windows are flanked by pilasters with capitals incorporating bead work and supporting an entablature, all of cut-stone. Above the entablature triangular pediments appear over each opening. The four entrances are announced by porticos surmounted by non-functional balconies. Paired stone columns support an entablature of stone, above which was originally a balustrade. This has now been replaced by a simple parapet. The exterior has been modified but still retains much of its original character. During the 1930s many details were removed. The Goddess of Justice, which has been the target of at least one sharpshooter, was taken down. Then the exterior sheetmetal work, which evidently had deteriorated, was removed. Included in this was the tower which had been considered a problem because of visitations by “young, indiscreet, and often times imprudent and irresponsible parties”. In addition, the entablatures and roof balustrade were replaced by a new cut-stone parapet which now conceals the roof. Much of this work was financed by Federal Emergency Administration of Public Works Funds, with J.E. Johnson as architect and McClellan, Brown and McClellan, as contractors. More recent alterations include installation of new glass and aluminum doors and window sashes. Among the finest remaining nineteenth-century calabooses in Texas, the Milam County Jail was constructed with exterior walls of St. Louis pressed brick trimmed with stone on a cruciform plan. As was typical within the state, the ground level contained living quarters for the sheriff. On the upper floors free standing iron cages comprised the cells. The Romanesque Revival style distinguished the building. Ashlar masonry forms base for the brick walls. Window openings to the sheriff’s quarters are spanned with Roman arches comprised of stone voussoirs with prominent archivolts. The door openings on the north, cast, and west are spanned with brick Roman arches, above which appears decorative corbeling and a panel of decorative geometrical patterns. The upper level openings, as well as ground-level door on the south, are all spanned by segmental arvhes of stone. The patterns of openings are similar on the north and south, and east and west. On the former pair of elevations, two evenly spaced openings appear in each arm of the masses; on the latter paired arched openings were incorporated into the ground story while single openings appear on the upper levels, all in symmetrical composition. Romantic details further enhance the building. At the corners of the walls and towers appear turret-like features supported on corbels with carved decorative features all visually tied together by a stone string course. The walls are terminated by crenelations — ancient military features communicating concepts of strength. Below these are decorative bands of brickwork. Chimnies decorated with corbeling contribute to the picturesqueness of the building. A tower rising from the center of the composition completes the skyline silhouette. Although the flat arch forms spanning the window openings do not appear elsewhere, the cranellations, stone string course and the corner features are repetitious of details found in other parts of the building. The exterior of the jail retains virtually all its original character. Likewise the interior remains unchanged; all the cells in the upper levels remain intact and are open for visitation. On the ground level, the furnishing of the sheriff’s quarters have been replaced by museum displays but the fabric remains intact. 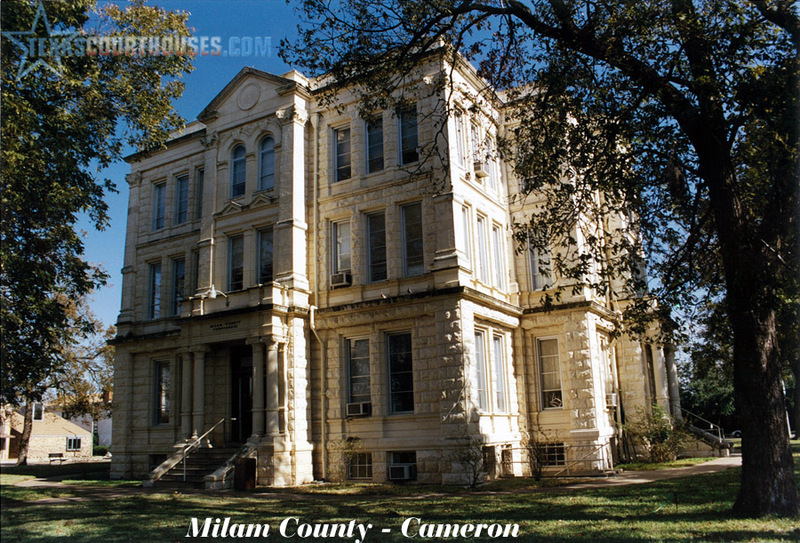 The Milam County Courthouse and Jail possess both architectural and historical significance. The Courthouse is an outstanding example of Renaissance Revival design and the Jail embodies a design theme inspired by Medieval military architecture which was intended to symbolize strength. These two buildings have been the center of activities involving law and order throughout the twentieth century; the courthouse continues in use while the jail is now a museum. Located in central East Texas, Milam County was named for Benjamin R. Milam, who served in the Texas army during the Texas War for independence. The county was created in 1836 from an area that had formerly been the municipality of Milam when Texas was a Mexican costate with Coahuila. In 1846, the state legislature made Cameron the county seat and the county attained its present configuration in 1856. The present courthouse is the fourth temple of justice to serve the county. As was common, the first was a small unsubstantial work which was used only temporarily. 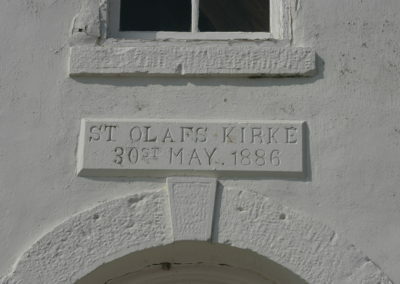 In 1874, a fire burned the second, and along with it the county records. Pending the construction of a new building, the Phillips Hotel was rented as a courthouse. Following a dispute over the permanent location of the county seat, the county contracted for a new brick courthouse with a “cupola and weather vane” in 1875. However, within a few years this building was continuously presenting maintenance problems: the fireplace in the county judges’ office smoked, offices required repairs, the roof leaked, and the cistern was too small. Finally, in 1889, a grand jury reported that this building was unsafe and recommended that the county build a new temple. Through an advertisement in the Galveston Daily News the county judge invited architects to submit plans and specifications for a new building. The firm of Larmour and Watson of Austin were the successful competitors and early in 1890, invitations to bid on construction were published in both the Galveston Daily News and the Fort Worth Daily Gazetter. Irregularities in biddinng resulted in a rejection of all bidders; then following a second competition a contract was awarded to Lee and Plummer for $82,385. The bid included removal of the old courthouse. However, William Plummer’s bond was decared insufficient, resulting in a delay in construction for nearly a year. In addition, the county apparently had insufficient funds to proceed. Meanwhile, loss on money cuased by the delay prompted the architects and contracotr to make a claim against the county. To help settle the dispute, Jacob Larmour and A.O. Watson revised plans to reduce the cost. Construction then proceeded and on April 20, 1892, the building was officially accepted. After the Commissioners visited the courthouses in both LaGrange and Caldwell to inspect interior furnishings, the Burbrook School Furnishing Company of Dallas was awarded the contract to supply the courthouse furniture and venetian blinds. The construction of jails paralleled these last two courthouses. In 1874, the firm of Larmour and Klerke were employed as architects and the following year work was contracted and completed on a brick jail with iron cages shipped from St. Louis, Missouri. However, on at least one occasion the jail was broken into, indicating a need for a more secure work, although a substantial wooden fence had been erected and steel installed on the cell floors. In 1884, additional work was done on the jail by P. J. Pauly and Brothers of St. Louis. Finally, in 1893, it was determined that this jail was too small and a new building was needed. Two years later commissioners ordered the construction of a new calaboose. The Pauly Jail Building and Manufacturing Company was awarded the contract for $18,883. This new building was built on the site of the structure it replaced. During construction, a house was rented as a temporary jail. The jail is now the Milam County Museum.